Choosing a poker website to play at does not necessarily mean you should choose PokerStars. Yes if you’re looking for a quick cash game or tournament, but there are other options where you can find good value. The decision on where to play in poker tournaments ultimately rests with you, but hopefully this article will make clearer some of the options available to international players – not Aussies unfortunately, as we cannot play online for real money as of September 2017 due to the new Interactive Gambling Act amendments. Tournaments are a completely different beast to regular cash games in that you cannot come and go as you please. Things like Multi Table Tournaments require constant concentration and endurance with some games going for days at a time. We will have a look at where the best places are to get involved with online poker tournaments, what sort of tournaments are on offer, what you can win and roughly how much you can expect to pay for entrance. The following sites offer a range of tournaments with differing buy-in amounts to cater for every aspiring poker champion. Each of these sites boasts a wide range of available tournaments and they are not all exclusively Texas Hold ’em. Obviously Texas is the most popular tournament format but you can also find tournaments for Omaha Hi and Hi/Lo, Stud Hi and Hi/Lo, Razz, 5 Card Stud and Draw Poker. Check each site for details on when tournaments are scheduled and each sites terms and conditions. Obviously there are more than one sort of tournament available to play at each site and tournaments aren’t reserved exclusively for Texas Hold’em. No, there are tournaments available for Omaha, Triple Draw, Irish and of course Texas, just to name a few. The tournament types include Satellites, which can be a pathway to bigger land-based events, sit-n-go’s, free rolls and many other tournament types. But what sort of online tournaments are out there? What best suits your playing style and patience level? Let’s have a quick look at what sort of tournaments there are. In a multi table tournament each player, after their buy-in, is staked the same amount of chips and placed at an initial table. The winner of each table proceeds to the next table which consists of winners from the previous round. This goes on until the final table results in an overall winner. The top prize for Multi Table Tournaments is usually rather large thanks to the amount of people that register for each one. Winning Multi Table Tournaments can also earn you a solid reputation very quickly. Sit-n-go poker tournaments are where the player numbers are capped and when this number of players is reached the tournament begins. Websites like 888 Poker and PokerStars have plenty of these types of tournaments, including micro stakes, low stakes, medium stakes and high stakes. With buy-ins ranging from anywhere from $1-$1 million. Heads Up Tournaments are essentially one on one matches which may seem easy at first glance but these types of games generally seem to be won by the player with the greater skill. Heads up games are very tactical and it is best to resist the temptation to go all in on your first decent hand. Play smart. Free Roll Tournaments are great for beginners or those low on funds because they are free to register and play. Winners of Free Roll Tournaments can win cash prizes or tickets in to other, more illustrious, tournaments. All you have to do is be a member of the poker site and register for the tournament to take part. You then download the client software or play on your smartphone or tablet. Satellite Tournaments are a much cheaper buy-in option for people looking to get a seat at a big money tournament, whether online or at a bricks and mortar event like the World Series of Poker. While PokerStars probably has the most of these types of tournaments, we find playing at 888 Poker can sometimes be advantageous because there tends to be a weaker field of players. 888 Poker is the only one of the big three poker sites to provide mobile services to international customers. 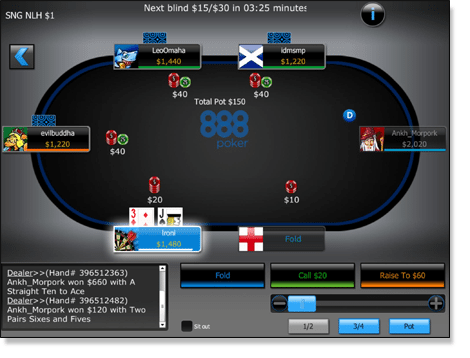 The 888 poker website allows you to play in a variety of tournaments with some hi and some low buy in amounts. PokerStars and Full Tilt both used to provide mobile services but pulled their products from the market in 2013. Players worldwide have plenty of options when it comes to depositing at poker websites. We can use our Visas or MasterCards. We can use web wallets like Neteller or even pre-paid cards like Ukash. If you don’t want to send your card details over the internet you can use payment system POLi which is where you use your online bank via a secure payment portal, allowing you to transfer thousands of dollars to your chosen poker website. All banking transactions at online poker sites are encrypted with a minimum of 128-bit SSL (Secure Sockets Layer) Digital encryption. The sites are fully regulated and must abide by strict guidelines when it comes to keeping players funds and details safe.